I have a serious love affair with apple desserts – caramel apples, apple doughnuts, apple turnovers, and of course the beloved apple pie. Don’t tell anyone, but I’ve made three apple pies in the last ten days. Yup. Three. And why would I do that? Well, aside from the obvious fact that apple pies are so darn delicious (warm, cinnamon sprinkled apples wrapped in a buttery, flaky crust), I also went apple picking. It was our first trip to the apple orchard this season, and boy, was it awesome! We ate enormous caramel apples, the most amazing apple cider doughnuts, and we picked a ton of apples. This year we picked liberty apples. I’d actually never heard of that variety, but I LOVE them. They’re a more tart version of my absolute-favorite honey crisps. Turns out that they’re also perfect baking apples. In an attempt to appease my crust-loving family, I made an apple tart rather than a pie. I figured that it would be a higher crust to filling ratio. Boy, did they love it! It looks pretty fancy, but I have to say that it was actually a lot easier than making a pie because I used half the apples I normally use to make a pie. That means half the peeling and chopping, and just as much deliciousness as a pie! 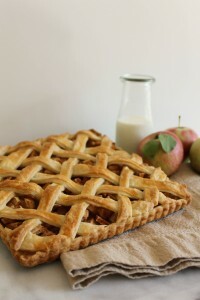 This apple tart features warm apples sprinkled with sugar, cinnamon, and nutmeg and wrapped in a flaky, buttery crust. For the crust: In a medium bowl, mix the flour, sugar, and salt. Sprinkle the cold butter pieces over the dry ingredients. Using your fingers, crumble the butter (or cut the butter) into the flour mixture. Continue to do so until there are large, pea-sized clumps of butter still visible in the mixture. Add the ice water a few tablespoons at a time. Mix enough water in for the dough to form a ball. Separate the dough into two pieces. Flatten each piece into a disk. Wrap the disks in plastic wrap, and refrigerate for at least 1 hour. While the dough chills, make the filling. For the filling; Mix the apples with the sugar, flour, spices, and salt. To assemble the tart: Preheat the oven to 500 degrees F, placing a baking sheet in the oven as it preheats. Remove one disk of dough from the refrigerator. Sprinkle your work bench with all purpose flour. Place the dough on your bench, and sprinkle the top of the dough with flour as well. Roll it out to about ⅛ inch thickness. 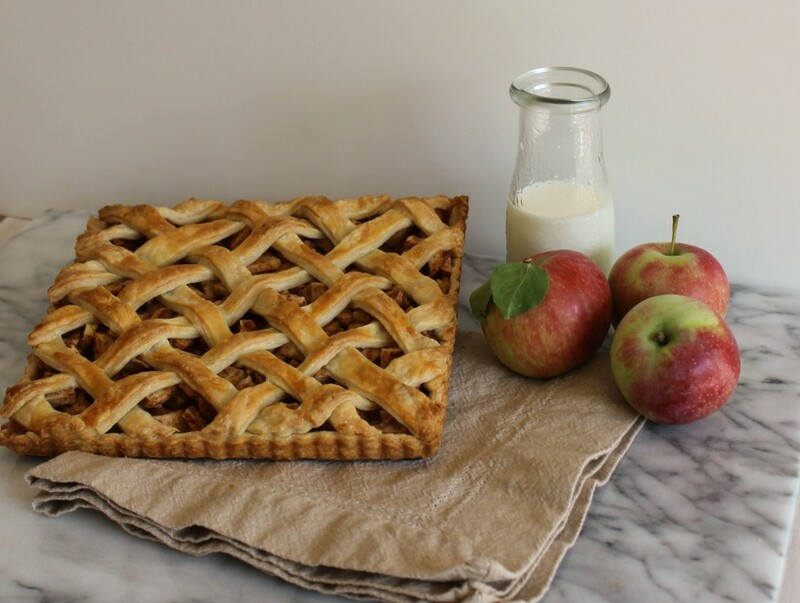 Fill the tart shell with the apple filling (including all of the apple juices). Place the tart pan in the refrigerator while rolling out the top crust. Prepare your work bench as you did with the first piece of dough. Once the dough is rolled out to about ⅛ inch. Cut ¼ inch strips out of the dough. Remove the tart pan from the refrigerator. 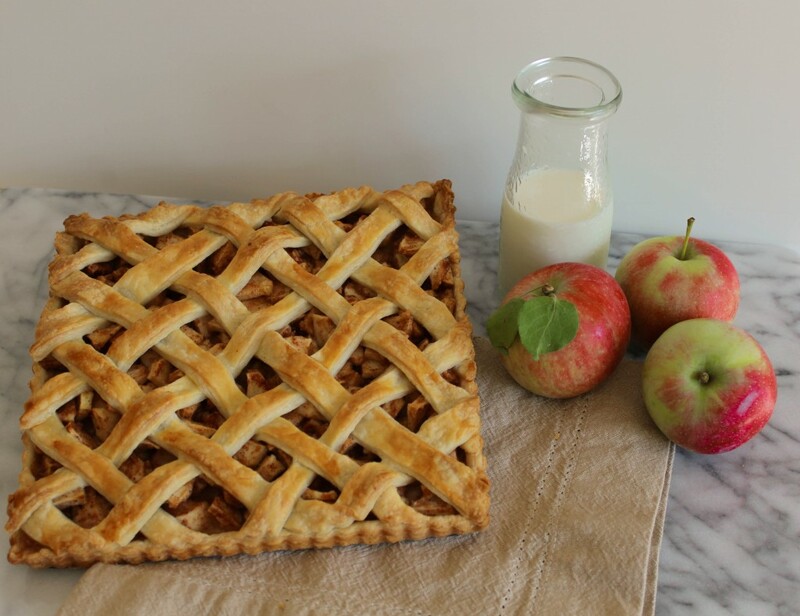 Arrange the strips on top of the tart in a lattice pattern. Brush the top of the tart with the egg and water mixture. Place the tart on the baking sheet that was preheated in the oven. Immediately turn the temperature on the oven down to 425 degrees. Bake for about 20 minutes. Turn the oven down to 375 degrees and bake for about 10 to 15 minutes longer, until the crust is golden brown. This post is linked to these parties. Everything you make is just so darn pretty… absolutely stunning. Thanks for bring this to Weekend Bites. Pinned. Aida, this is SO pretty! 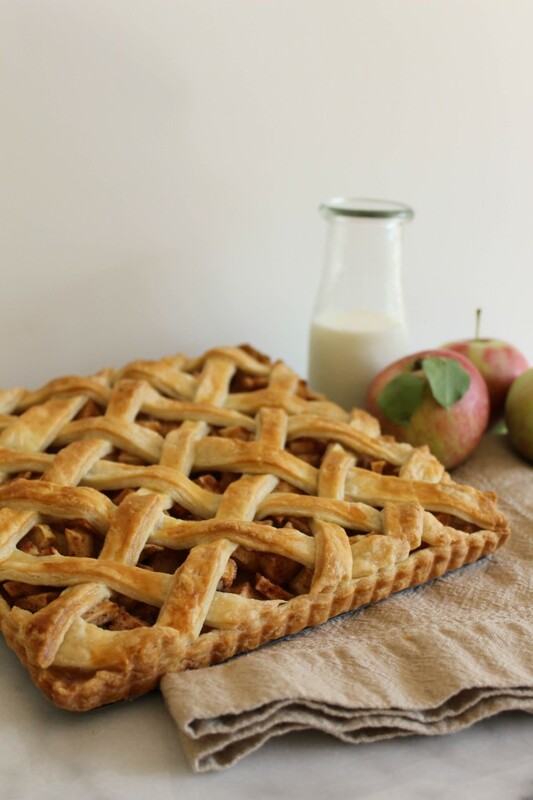 I can’t blame you for baking 3 apple recipes… I can’t seem to make any since the kids just want them plain! Thanks so much for sharing at SNF. Pinned! Just want you to know that your recipe is being featured on Weekend Bites today. I will be pinning and tweeting it this week too.